Ben Coley had a 100/1 third last week as his profitable season continues and he's looking for each-way value at the Made In Denmark. It's something of an understatement to say that European Ryder Cup captain Thomas Bjorn has a lot on his plate at the Made In Denmark. Not only is he playing at the course he grew up on, som ething he admits will bring a tear to the eye of one of the most fearsome men on the circuit, but it's also approaching decision time when it comes to making his selections with a month to go until Europe bid to win back the famous trophy. Bjorn will name his four wild cards next Wednesday but first he'll be powerless to determine who bags the final qualifying place, with seven names confirmed and only Thorbjorn Olesen, Matthew Fitzpatrick and Eddie Pepperell able to secure the coveted eighth spot. Olesen has surely done enough already to book his flight to Paris, but it's fair to assume that neither Pepperell nor Fitzpatrick will feature unless earning taking his place in the top eight and even victory here may not be enough to do that. Ties could complicate things, but it's clear that a top-six finish from Olesen in his home event would be enough and though he perhaps won't admit it, Bjorn would like to see that happen. For some punters, all this Ryder Cup talk is tiresome and I get that, but I am adamant that it is relevant. Though none of them have won, Olesen, Pepperell and Thomas Pieters have all featured prominently at some stage over the last fortnight and many will recall Edoardo Molinari winning at Gleneagles in 2010 to force captain Colin Montgomerie into a late change of plan. Since qualifying concluded in the USA, two events have been won by two Ryder Cup hopefuls, latterly Bryson DeChambeau who will now certainly receive a pick from Jim Furyk. Behind him on Sunday was Tony Finau, who produced his best performance of a tremendous season and one that many believe also secured his selection. Players can and do take care of business when their backs are against the wall. Back to Denmark, and Pieters also comes into the equation here. He's not able to qualify, but victory would surely earn him a call-up and that's exactly what happened in this very event two years ago. He's infuriat ing, and the way he let a fantastic opportunity slip last week was disappointing, but I'm not surprised one firm's opening 18/1 has been taken because he's well capable of putting behind him the disappointment of Prague and winning here. Again, that's exactly what he did in 2016, though the circumstances were a little different. The trouble with backing Pieters is the course. At just under 7,000 yards yet playing to a par of 72, it's hard to know exactly what to expect of Silkeborg Ry Golf Club. Courses of this length with four short par-fives ought to be cannon fodder for the best players in the game but if the scorecard is right - and that's not a given, especially as the European Tour website lists the 12th as a 352-yard par-three and the 13th as a 168-yard par-five - then it's hard to imagine it's going to play perfectly to the strengths of Pieters, or Olesen for that matter. Perhaps it's more a Pepperell course, given his preference for hitting anything but driver, but it's Fitzpatrick who would get my vote from those at the top of the market. A short, straight-hitting type who has won at the tree-lined Woburn and over in Sweden, his closing 54 holes at the Wyndham Championship offered great encouragement and it should be remembered that, at 23 years old, he has four European Tour titles to his name. With the latest of those having come at around this time last year on a short course in the Swiss Alps, Fitzpatrick has plenty in his favour but given the guesswork involved when it comes to the venue, the pressure which is on him and, yes, the frustrating fortnight followers of this column have endured via Olesen and Pieters, I'm compelled to be much more speculative. This young American is in the early stages of his career but has already bagged a PGA Tour top-10 at a tight, turning golf course in Mexico, while more recently he's been banging on the door on the increasingly competitive Canadian Tour. 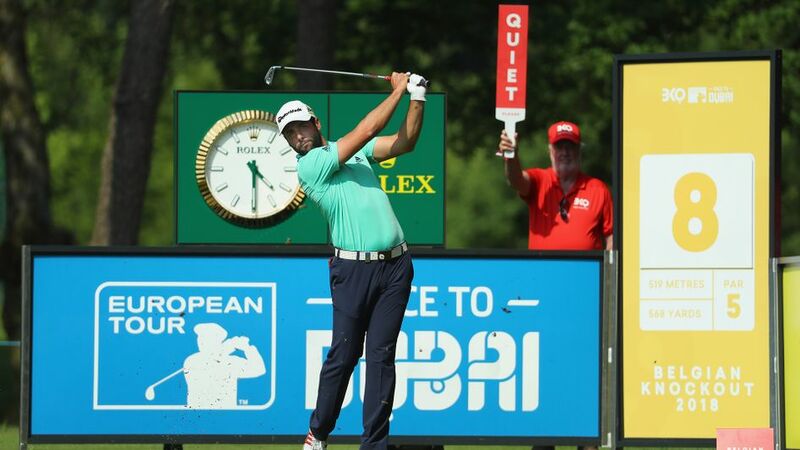 Taking advantage of invites in Europe, he then contended in Sweden where he sat fourth at halfway until understandably struggling over the weekend, before creeping nicely into ninth place last week in the Czech Republic. Stewart's stats over this fortnight have been particularly impressive. He's been inside the top 10 in the all-around in both events and, perhaps tellingly, ranked third and sixth for ball-striking to suggest that as he makes his way in the game, it's his accuracy from tee-to-green that will pay the bills. Given that reports from Silkeborg suggest that this is a fairly tight, parkland layout lined by trees and with water hazards dotted around, perhaps straight and steady will win the race a nd his performance on potentially similar terrain in Sweden, where he sat fourth at halfway, is therefore of great encouragement. It's also notable that Stewart hails from the same college as Brandt Snedeker and played Walker Cup golf with DeChambeau so he need not look far for inspiration in an event won last year by Julian Suri, against whom Stewart played as an amateur - typically faring much the best. Suri's clinical display here last year also boosts the case for local man J.B. Hansen, the Dane who leads the Challenge Tour money list having won twice this year, including by five shots when last teeing it up on home soil. Hansen looks to finally be delivering on his promise and will surely do well back on the European Tour next year, but he was near last in last week's Rolex Trophy and while he could bounce back, 80/1 isn't quite big enough when it comes to chancing him to do so. Assuming this is a very different test to the Czech Mast ers, played on a course which offered next to no threat from the tee, there could be some mileage in siding with more accurate types who've not had their conditions and that's why I'm prepared to chance Bradley Dredge. The Welshman was 29th in the Porsche European Open on a huge course and then returned from three weeks off to finish 34th in Sweden, a performance from which he can build now heading back to Denmark having wisely sat out last week. Dredge will rue the switch from Himmerland, where he'd twice been runner-up and also finished sixth in just four visits, but returning to the country remains a positive and there's less pressure attached, while we're also getting twice the price we perhaps would have. At 124th in the Race To Dubai, he is absolutely under pressure to earn a decent cheque over the next month or so but there have been signs lately, such as when seventh at halfway in Sweden but also in the Open de France where he led after the first round, that his game is coming together in time for that. Dredge is an infrequent winner, the second of two European Tour titles coming some 12 years ago, but over the last few years he's been a feature in this event and while the move to Silkeborg isn't a positive, it need not be a significant handicap. Adrian Otaegui is another steady type whose recent form is perhaps better than it appears, with 65th in the PGA Championship an effort more likely to inspire confidence than cause for concern given the long, soft nature of Bellerive. Indeed, the Spaniard fought back brilliantly to make the weekend on what was his first major championship start and could now get back in contention at a course which seems sure to better reward his trademark accuracy from the tee. Otaegui won the Paul Lawrie Match Play on a parkland course in Germany last summer and the Belgian Knockout on a tight, tree-lined layout made for fairway-finders in Belgium, so the hope is he's equally well suited to Silkeborg in which case he'd rate a threat to all. Like Dredge, he can call upon fond memories in the event having contended all the way to the finish when third in 2016 and I can't see why he'd be behind the likes of Lee Slattery, Tom Lewis, Erik van Rooyen and Richard Sterne in the betting. Matthias Schwab is a youngster going places and for now is best followed on courses like this one, while Marcus Kinhult came close to selection having finished off on the front foot in the Nordea Masters, where he opened with a round of 70 which ought to have been several shots lower. The young Swede came into that event feeling under the weather and if he's back in full health now, there's hope h e can build on a promising effort in the Open and confirm that his accurate game could take him a long way on the European Tour. Both are respected, but neither has been missed and I really am keen to ensure this event is treated with caution. With that in mind, a small bet on Peter Hanson is advised in the hope that he can build on a promising start to last week's Czech Masters. The former Ryder Cup player sat seventh at halfway, three off the lead and closed in with birdies at each of the first two holes in round three, only for a disastrous triple-bogey to effectively end his challenge. In the end he finished down in 50th with the also-rans, but Hanson struck the ball well in the main, ranking ninth for greens hit, and there was just enough in his display to take on board the obvious risks. It was at around this time last year that he started to pick up a couple of decent cheques which just about saw him finish inside the magic 110 on the Race To Dubai and while his last two starts in this event haven't been particularly good, his other two were both top-10 finishes. At his peak, Hanson was always most dangerous after the season's final major and the 40-year-old may yet have it in him to contend in an event like this one. Finally, while I considered Thomas Detry, Robert Rock and Joakim Lagergren towards the head of the betting and names like Adam Bland, Phachara Khongwatmai, SSP Chawrasia and Scott Vincent all found their way onto the shortlist, I'll side with Matt Nixon. Big things were once expected of the 29-year-old but five visits to Qualifying School tell you that he's had to fight hard to forge a career in golf, something which looked a given when he turned professional. He still looks to be improving to me, though, and he's played really nicely all summer with the highlight ninth place in the European Open, surrounded by 24th in Irel and, 34th in Sweden and then 24th again last week in the Czech Republic. Tee-to-green accuracy is his forte and his record in Denmark is strong enough with a top-10 finish on the Challenge Tour and a very encouraging start to this event in 2014 before a poor third round in blustery conditions cost him any chance to win. Nixon actually won over in Copenhagen as an amateur so returning to this part of the world could be the difference for him and if he does continue to strike the ball as he did on a course which is a little long for him last week, a place is not out of the question as he seeks to avoid a trip back to Q School. Posted at 1910 BST on 27/08/18.